Yes to passion. No to obligation. No intentional perpetuation of racism, sexism, transphobia, ableism, or any other harmful power structure will be tolerated. We defer to the recipient of any action to decide for themselves whether that action was innocent or harmful, and we support them in finding a resolution that prevents repeated abuse. Verbal, physical, and/or sexual assault will not be tolerated. Mistakes are human; assume best intentions. We are all ongoingly working to unpack harmful behaviors and language. Microaggressions and other slip-ups will be either privately called-in by a friend or addressed in the moment, depending on the context and scope of the behavior/language to be addressed. We act in solidarity, not charity, with marginalized groups and individuals. This group does not have a hierarchical view of intersections of oppression. We always defer to lived experience. Share from your own personal experiences. If it would be helpful to the group to share someone else’s story, do it anonymously unless you have their explicit consent to share identifying details. Not everyone will want to share their stories and that is okay. Mutual support is essential, but please ask first if you need emotional labor. We respect each other and, in the name of voluntary relations, emotional labor will be respected. We are a horizontally-organized collective. No one has a higher rank than anyone else, and we treat each other with the respect of equals. For specific projects or actions we may designate conveners or point people. Their role is to simply convene the group, ensure that things move forward, and to be a point of contact. They should have no more power than anyone else. It’s always okay to say no to a task and it is always okay to ask for support. We respect our own and each other’s use of personal energy. We practice active listening, listening to each other completely and with intent to understand, rather than listening simply to respond. We respect that people have different communication styles and levels of comfort with vulnerability. It is important that everyone feels comfortable to share thoughts and feelings. This means making it clear to everyone that their contributions are welcome. You are a contribution! At the beginning of the meeting, we will establish the facilitator(s), notetaker(s), and the stacker. Ideally, these jobs rotate each meeting. We then proceed to check-ins with name, pronouns, and highs and lows of the day (or another question at facilitator’s discretion). The facilitator makes it clear when we are switching topics, allowing everyone a chance to add last thoughts before moving on. Progressive Stacking: Progressive stack is used to give marginalized groups, voices that are often submerged, discounted, or excluded, and those with lived experience a greater chance to speak. At the end of meeting, we check in about thoughts and feelings about the meeting process, and everyone gets a chance to say what they need to say to be complete with the meeting. Check in with involved people who miss meetings to let them know what happened, to answer questions, and to see if they want to be involved in anything that was discussed. Feedback on collective process is invaluable and vital for growth. Facilitators invite and welcome feedback to become more effective in their role. Unpolished comments and feelings are welcome. The content of people’s ideas are more important whether they phrase them “perfectly” or not. We don’t want to lose valuable contributions just because they’re not yet fully formed. We do frequent quick temperature checks for big and small decisions. This ensures that everyone is on the same page and welcomes even slight hesitations that can end up being valuable concerns. The facilitator has two main responsibilities: 1.) to help the group reach agreement on topics, issues, and proposals, and 2.) to keep the meeting moving through the agenda in a timely manner. The meeting facilitator refrains as much as possible from passionately participating in discussion. If they want to participate more directly or feel their feelings on an issue cloud their ability to continue facilitating, they may pass on their duties to someone else, clearly letting the group know that this is what they are doing. To get on Stack raise one hand and look to the stacker to confirm your addition to stack. You will be called in the order you were added. Direct response is both hands moving alternately front to back. This shows you have something that must be said after the person speaking, usually for clarity’s sake. This symbol jumps stack and should not be misused. Clarifying question is a single hand formed in the shape of a C. This shows one has a question or comment necessary to clarify what was just said. This symbol jumps stack and should not be misused. Point of process is a triangle formed by two hand. This sign shows one has an idea for how to improve meeting process. This symbol jumps stack and should not be misused. Up twinkles are both hands raised with fingers pointing up and being wiggled. Twinkles indicates agreement, with what is being said or with a consensus proposal. 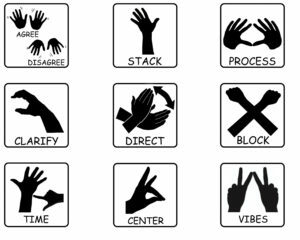 They are borrowed with gratitude from ASL’s word for applause, so that listeners can show enthusiasm without interrupting the speaker. Flat hands means that you are unsure, not for, or not against. One may be asked to clarify one’s position. Down twinkles are arms raised but with fingers pointing down and wiggling. Down twinkles indicate disagreement with what is being said. One may be asked to clarify one’s objection. Hard block is holding arms up and crossed. This indicates a firm opposition to the proposal. This signifies the that the approval of the proposal goes against the interests or principles of the group, and that the person blocking is willing to leave the group if the proposal is adopted. Time is pointing to your wrist. This means we are running over time. Reminds group to be aware of the time. Re-centering Llama is a hand raised with the index and pinkie fingers raised and the remaining fingers making contact in the center, like a long llama nose. This sign shows that the discussions has strayed from the original topic and gently refocuses the group. Vibes Watch is two “v” hands coming together to make a “w”. Signals that things are getting tense. Lets address it or take a break. NAC stands in solidarity with the activist community as a whole. We are all working towards the common goal of creating a better, more equitable world. As a collective, NAC generally focuses on local issues and stays out of inter-activist group conflict unless we have first-hand knowledge of the situation.